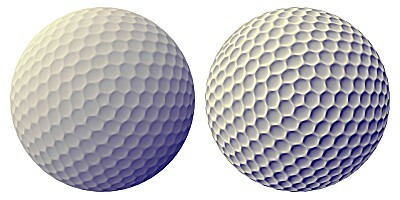 Simple diffuse lighting (left) results in lower contrast in the upper-left and lower-right regions of this golf ball, where the surface is facing towards or away from the light. Our proposed exaggerated shading (right) brings out detail throughout the surface by locally moving the light direction to be grazing with respect to the surface. In fields ranging from technical illustration to mapmaking, artists have developed distinctive visual styles designed to convey both detail and overall shape as clearly as possible. We investigate a non-photorealistic shading model, inspired by techniques for cartographic terrain relief, based on dynamically adjusting the effective light position for different areas of the surface. It reveals detail regardless of surface orientation and, by operating at multiple scales, is designed to convey detail at all frequencies simultaneously. Szymon Rusinkiewicz, Michael Burns, and Doug DeCarlo. Exaggerated Shading for Depicting Shape and Detail. ACM Transactions on Graphics (Proc. SIGGRAPH) 25(3), July 2006.